I’ve been wanting a wood turning lathe for a while. I thought about adapting my South Bend metal lathe to do wood turning, and even picked up a spur center (and morse taper adapter at the South Bend has a #5 MT in the headstock) and some inexpensive used turning chisels. But when I thought more seriously about doing this I decided it wasn’t a great idea. I’m not thrilled about wood and grit on a precision lathe, but also the bulky carriage would be in the way. So I set that aside, and have been keeping my eyes open for a ready-to-go wood lathe. Last weekend a lathe turned up on Craigslist in my area and I snapped it up. Kolya and I tried it out last night and it works great. Neither of us has ever done this before, but we both made a small candle holder. 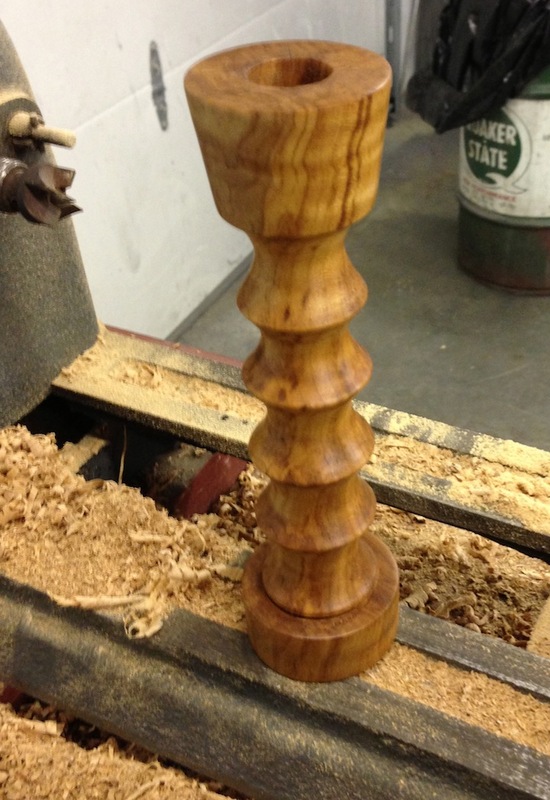 I used some figured maple, with just a quick slather of an oil/wax mix. Kolya dived right in like a pro, wailing away at a block of figured myrtle. We’re both making it up as we go. 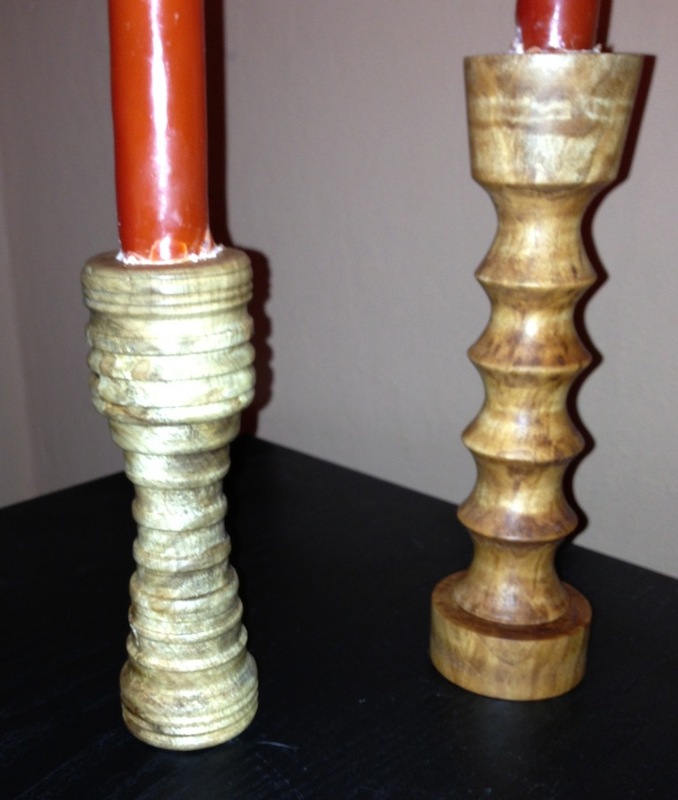 Here are our finished candlesticks. Kolya decided to do a nifty grooved pattern on his. I was concerned about his base being too small, but aesthetically is works for me – and it’s plenty stable in fact. I picked up an armload of turning blanks from Global Wood Source the other day on my way home from work, including a couple of small Walnut bowl blanks – so more to come. I hope to do more on my workbench Saturday while Kolya sprays chips everywhere. I have old shopsmith (really old, it’s predates the company that makes them now) that does basicly one speed, and is a beast. But it works like a charm, and I can do all sorts of fun stuff. Something to consider, since it’s close to the holidays, pen turning. Wow! It sure looks like you guys are havin’ fun! 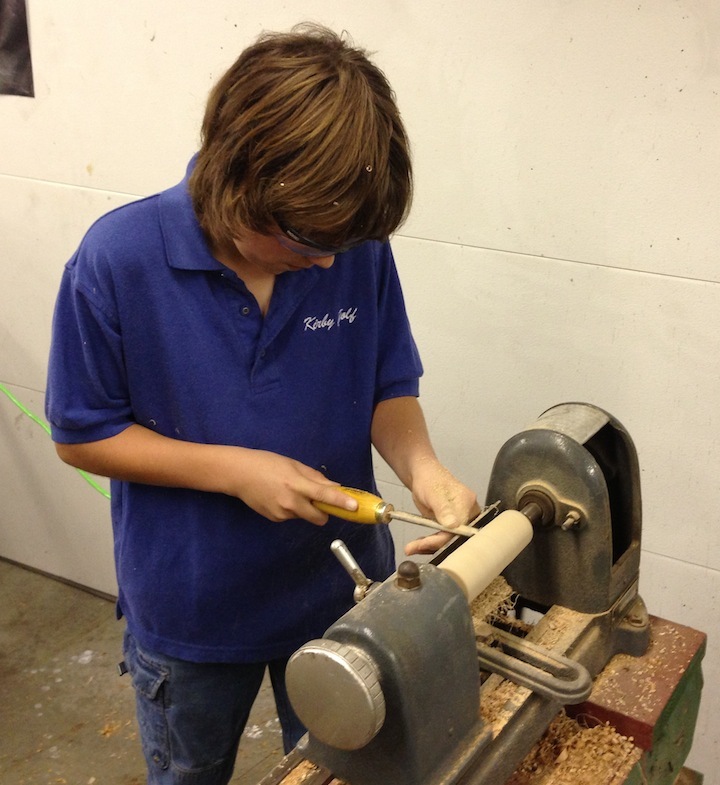 I’m glad you’re happy with the lathe Joe. You and your son have used it more in one day, than I did in five years! Get some face shields and dust masks to protect your health. Gloves would be good too. Face shields yes. Dust masks, perhaps – but this didn’t really make much dust, mostly chips/shavings, there wasn’t any visible airborne dust. Gloves would be a Very Bad idea. Never use gloves on a rotating spindle tool like a lathe or a drill press. If you snag the glove on the rotating part it will pull your hand in. Its not the amount of dust, minimal with sharp tools, but the species and fungus you are dealing with. As far as gloves go, they are for holding the tools not for touching the revolving spindles or wood. That you should never do. I’ve worked with and around such rotating equipment for the last 35+ years wearing gloves without incident. Dust mask is a must! Lungs are sensitive and you generate a lot of small hard to see particles. Face shield is a good idea too. I bounced a sharp broken spindle off the center of safety glasses once, an inch higher or lower and it would have been a trip to the ER. Yep, totally agree on the dust mask and face shield. It’s on the list for our trip to the lumberyard today. I tend to be lazy about that, but I promise.